Train to Machu Picchu all aboard! Get easy The ticket to the trip of your life. Machu Picchu is waiting for you. Buying your train ticket online is easy. Check the prices and schedules of your tickets in a clear interface. You just have to print the ticket and present it the day of the trip. Choose the type of service of your preference. We take care of organizing the best schedule so that you arrive punctually to your visit to Machu Picchu. Because your trip does not end with a ticket, we are here to help you at all times. Contact us with any questions about your trip to Machu Picchu. 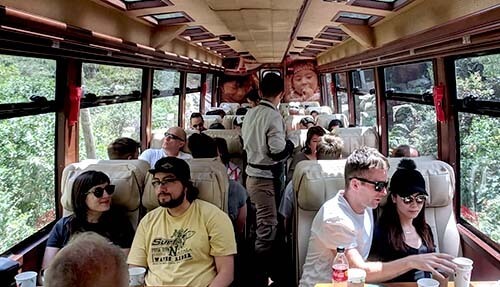 The All Aboard Service assures you a safe and punctual trip to Machu Picchu. By buying your train ticket with us you are ensuring your visit to the Inca City. The service gives you several benefits such as discounts, quick booking and your way. You can contact us at any time. Because your trip does not end with a ticket, we are here to help you at all times. Contact us at info@boletomachupicchu.com or call us at 084-403077. Children from 0 to 2 years old do not pay. In addition, children up to 11 or 12 years have up to 50% discounts on the normal price of the train ticket. We are Machu Picchu Terra a company with years of experience doing all kinds of services in the Inca City. We are authorized by the Peruvian authorities with code MA0473. Trust your train trip to Machu Picchu to the experts! Buy online and in advance your train tickets to Machu Picchu. We are professionals at the service of tourists who dream to know Machu Picchu. With us you can travel safely and with a guarantee of good service. The All Aboard Service offers discounts for a family train trip. Children up to 12 years pay approximately 50% off the normal price. Babies from 0 to 2 years old do not pay the price of the ticket. Free travel with children from 0 to 2 years old. Children from 0 to 2 years enter the train for free if they do it in the same seat as their father or mother. Only one child is allowed in the arms or legs of a person. Children from 2 to 11 years old have almost 50% discount on Peru Rail train services. They travel accompanied by their parents. Children from 2 to 12 years old have a discount of almost 50% on Inca Rail trains. Only one child is allowed per purchased adult ticket. Children travel with their father or mother. The 'Expedition' train is designed for travelers who like comfortable and quality service within budget. 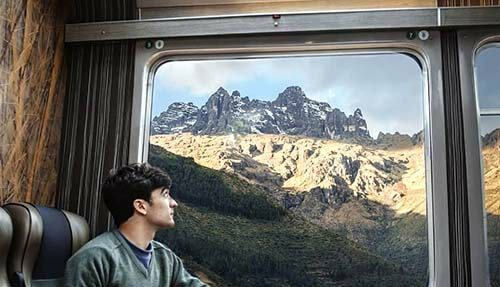 The 'Vistadome' train is a service designed to appreciate the beautiful landscapes of the Sacred Valley of the Incas. It has panoramic windows, shows on board, courtesy snack and comfortable seats. Dance show and parade on board .. 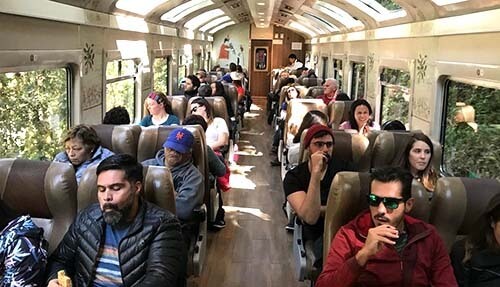 The train 'Sacred Valley' is a special luxurious service that includes a bar car, lunch or gourmet dinner and hot Andean drinks. The train makes a stop at the hotel Belmond Río Sagrado de Urubamba. Dessert or glass of wine. 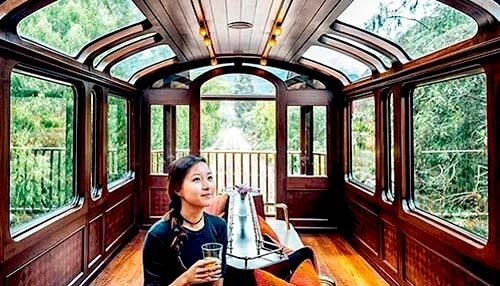 The 'Hiram Bingham' train is one of the most luxurious in the world. It has bar car, dining room and observatory. Includes dance show, welcome cocktail, gourmet lunch or dinner, free bar and comfortable seating. The 'Voyager' train is designed for tourists who are looking for a comfortable, pleasant service with good service on board. Includes typical drinks and musical atmosphere. The '360º' train is specially designed to appreciate the landscapes of the Sacred Valley. It has large windows on the sides and roof. Includes bar car - observatory. 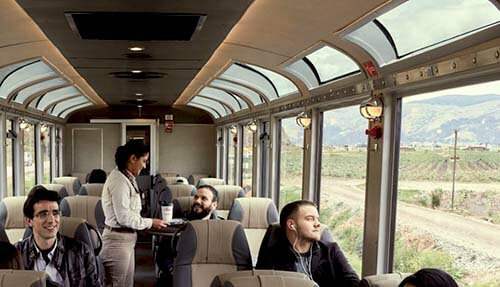 The 'First Class' train is an exclusive service with comfortable seats, large windows and a bar car - observatory. Includes gourmet lunch or dinner, ambient music, complimentary drinks and on-board service. 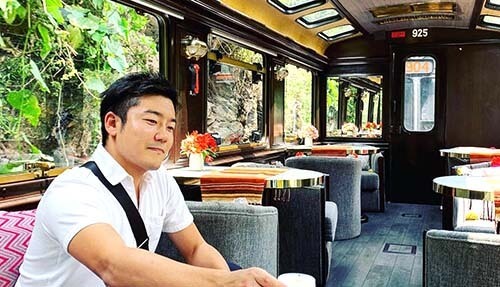 The 'The Private' train is a luxury service that operates only at the request of the tourist. The car is designed with Andean theme. Includes welcome champagne, typical menu, snacks, free bar and comfortable seating. Typical menu of the region. The trains depart at different times from 3 stations: Poroy, Urubamba and Ollantaytambo. However, most Peru Rail or Inca Rail trains depart from this last train station: Ollantaytambo. Do not know what schedule to choose? Make your reservation by selecting the type of train and the date of your visit to Machu Picchu. We will take care of choosing the train schedule that best suits you. 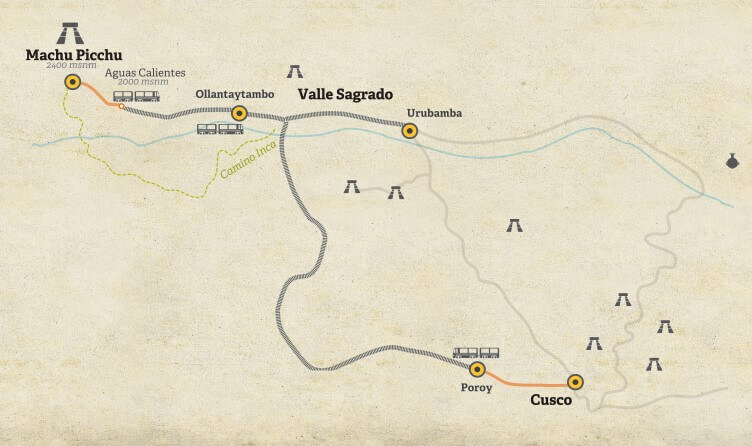 You can choose to take the train from the stations Poroy, Urubamba or Ollantaytambo. When you arrive in Aguas Calientes, you must board one of the buses that will take you to Machu Picchu in 30 minutes. 1) What route does it cover? The trains cover the route Cusco - Aguas Calientes (Machu Picchu Pueblo). From there you walk or take a bus to the entrance gate to Machu Picchu. 2) What stations are there? In Cusco there are up to 3 train stations: Poroy, Urubamba and Ollantaytambo. The latter is the most used. The point of arrival is the Aguas Calientes station. In addition there is a long route called 'Hydroelectric'. 3) How long does the trip take? The time of travel by train depends on the boarding station. From Poroy it takes 3 hours 30 minutes. From Urubamba it takes 2 hours 30 minutes. And from Ollantaytambo 1 hour 30 minutes. The times are approximate. 4) How much does the train ticket cost? The price depends on the type of service that the tourist wants. 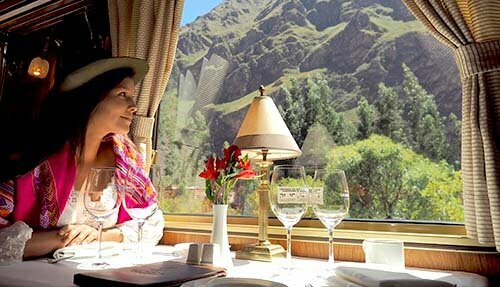 Peru Rail offers 4 services: 'Expedition', 'Vistadome', 'Sacred Valley' and 'Hiram Bingham'. 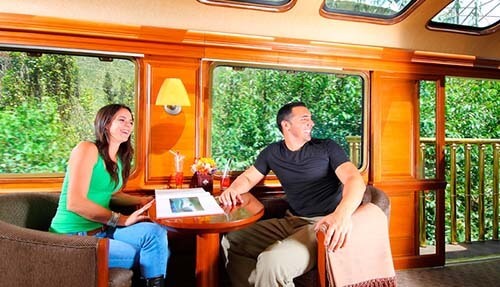 Inca Rail offers 4 services: 'Voyager', '360º', 'First Class' and 'Private'. Children from 0 to 2 years old travel free of charge if they are in the same seat as the father or mother. Children up to 12 years have a 50% discount (up to 12 years in Inca Rail and up to 11 years in Peru Rail). 6) How to buy the train ticket? Train tickets are purchased online with days or weeks in advance. If you buy the tickets once in the city of Cusco, you run the risk of not finding availability. 7) How far in advance is the train ticket purchased? It is recommended to buy train tickets 1 or 2 weeks in advance. During the high season of tourism (from April to October), tickets tend to run out faster. 8) How much luggage can you take? The hand luggage must not exceed 5 kilos. The luggage allowed is 15 kilos. If you travel with a baggage higher than this weight, you must add an approximate cost of $ 4.8 per extra kilo. Complete your personal information safely, easily and quickly. We monitor and take care of your purchases, because your security is priceless. Receive the electronic ticket and print it anywhere. Buy online and in advance your train tickets to Machu Picchu. Arrives at the train station at least 30 minutes before the departure time of the train. Print your purchased tickets and show them along with your passport (or identity document) at the time of boarding. The train station of Ollantaytambo is the one with the highest frequency of departures. To get there from Cusco you can hire a transfer service or do it on your own. Once at the Aguas Calientes station, you only have to climb a steep mountain to Machu Picchu. You can do it on foot or with the buses that depart from Aguas Calientes.